Indulge in the elegant beauty of Le Vian. 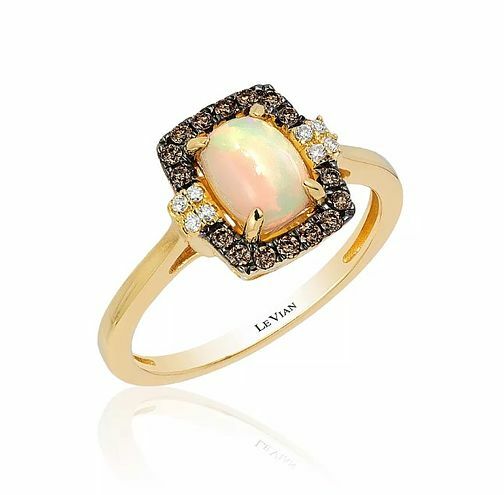 This stunning ring is crafted from sumptuous 14ct Honey Gold and features an intriguing Neopolitan Opal centrepiece, surrounded by a halo of Chocolate Diamonds and finished with Vanilla Diamonds for a look that simply dazzles. From ancient royalty to today's red carpet, Le Vian is the couture jeweller of choice. 14ct Honey Gold Neopolitan Opal & Diamond Ring is rated 1.0 out of 5 by 3. Rated 1 out of 5 by Anonymous from Do not buy le vian rings Given an H Samuel Le Vian ring as an engagement ring. It had to be fixed/replaced 5 YES 5 times due to diamonds and the main stone falling out. I ended up having to swop for a completely different ring and they made me pay the £100 difference! Terrible quality and appalling customer service. Do not waste your time and money.